A delicious balsamic kale salad that is perfect for a holiday side dish! Packed full of goodies: pears, pecans and havarti cheese crisps! Hello and welcome to the very last recipe for 2015! Can you believe the year is coming to a close? I can, and I have to say, I’m glad that it is. I can remember starting 2015 this year and thinking to myself “this year is going to be hard”. And it has definitely been a challenging one. But now I’m starting to look towards 2016 and I don’t know exactly what it will bring, but I am very optimistic! So I thought it would be fun to finish off 2016 with a simple, delicious and healthy recipe that would be absolutely perfect on your table for a holiday dinner: this balsamic kale salad, packed with goodies. Havarti cheese 2 ways (creamy cubes and crunchy crisps), pears and pecans, all tossed in a tangy maple-balsamic vinaigrette. Now you know what makes my perfect salad, right? 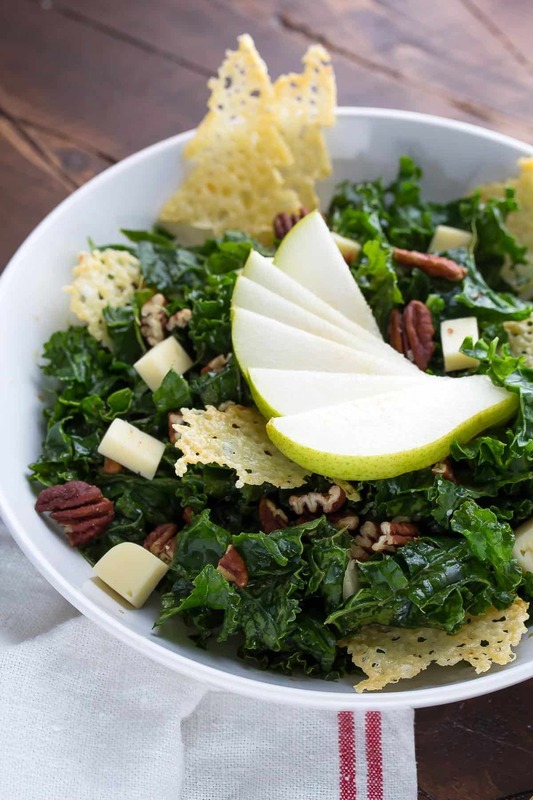 It has to have something sweet (pears), something crunchy (pecans), something leafy (kale), and cheese. There. Must. Always. Be. Cheese. So when I had the opportunity to try some of Arla Dofino’s Creamy Havarti Cheese, I knew right away how to use it. It has such a creamy texture and nice, mild cheese flavours that I knew would pair perfectly with tangy balsamic vinegar and sweet pears in a kale salad. To take things just a little further, I decided to use the cheese two ways. Firstly in crisp form. See those up there? Cheesy crispy goodness. 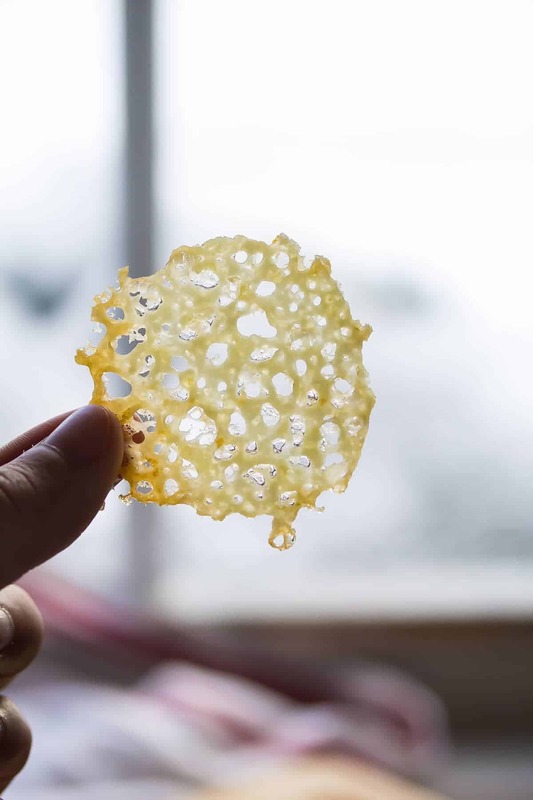 Just make small piles of shredded cheese on a baking sheet, bake for 6-8 minutes, and you will have these gorgeous little (highly addictive) havarti crisps. Because Arla Dofino Havarti is SO creamy, I also just had to use some cubes in the salad. These havarti cubes provide a creamy counterpart to all of the other textures in the salad. Plus the havarti-pear combo is just plain delicious! This is one of those great salads that you can make ahead of time. I definitely love anything that can be made ahead during the holidays, don’t you? It’s just perfect for taking to a holiday party. Just put keep the components separate and toss them all together when you get there! Happy holidays everyone! Let’s all stay safe and warm and eat lots of delicious food! Starting with a balsamic kale salad. Disclaimer: Thank-you very much to Arla Foods for providing me with their absolutely delicious products. As always, all opinions remain my own. Havarti Crisps Pre-heat oven to 350°F. Line a large baking sheet with parchment paper and set aside. 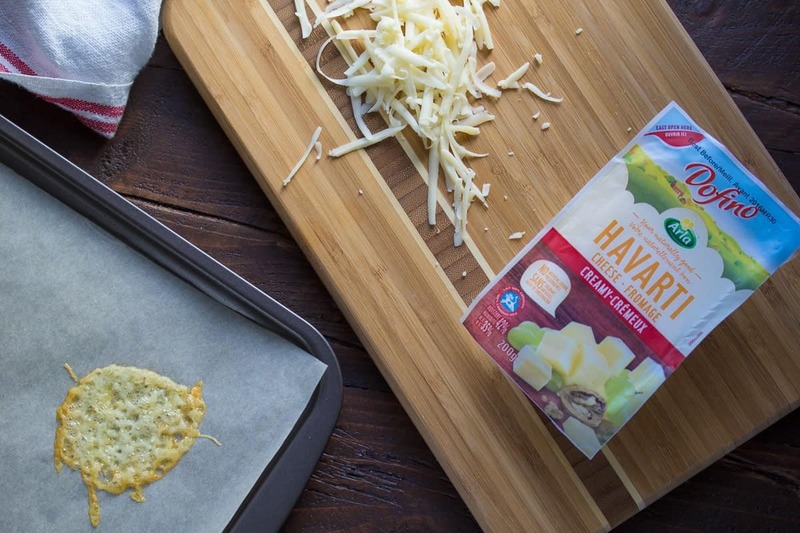 Make small piles of the havarti cheese, about ½ tablespoon of cheese per pile and 2 inches apart on the sheet. Bake in the oven for 5-10 minutes until the cheese becomes crispy (start checking on your cheese at 5 minutes to prevent burning). The edges will be slightly browned and the middle should no longer be jiggly. Remove from oven and allow to cool. Crisps may be made a few hours ahead of time. Kale salad To remove any bitterness from the kale, give it a 'massage' for a minute or so until it turns a darker green and is slightly 'wilted'. Toss together all the salad ingredients in the balsamic vinaigrette. Top with havarti crisps prior to serving. To make ahead: keep all components separate, and toss together just prior to serving. You must be so happy to say goodbye to 2015! I hope your 2016 is much less stressful! I’ve never made cheese crisps before but I love cheese and I love chips so I’m not sure why they haven’t made it to my kitchen yet! 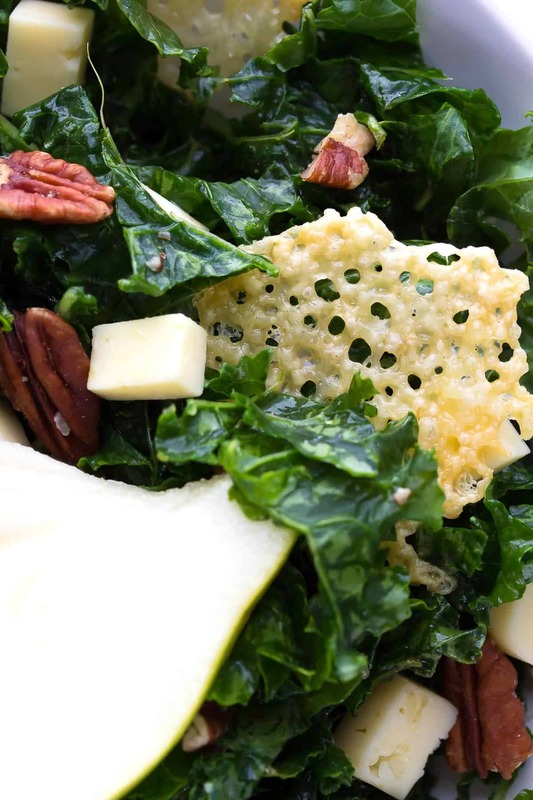 This kale salad is going on my to-do list this year! Buffalo Mozzarella! Caprese salad is my all time favourite cheese dish. Fig goat cheese is a close second. . patiently waiting to not be pregnant so I can indulge! I love mozzarella and on pizza. I’m addicted to cheddar – these crisps look so good! Holy moly that sounds like one seriously amazing mac and cheese, Christine! Thanks so much and happy holidays to you! I think I put feta in almost all of my salads, although it didn’t quite make it into this one. I have to try it on nachos now! Thanks, Dawn! Happy holidays! Thank-you so much, Jess! I shouldn’t have waited so long to try cheese crisps 😉 Merry Christmas and Happy New Year to you, too! My favourite cheese is harvarti and I love it used in a grilled cheese sandwich with fresh tomato and spinach. That sounds like an AMAZING grilled cheese, Andrea 🙂 Happy Holidays! I want this salad! I’ve never tried Havarti, but now I must. What a beautiful presentation. Pinning for sure. Thank-you so much, Andrea! Havarti is so nice…and so creamy! Happy holidays! I’ve been making brie turnovers with blueberry jam. I love Havarti, I actually not only enjoy it with salami and croutons in a salad but I use it in my lasagne as well as on pizza with mozzarella. It’ just adds that extra amazing flavour. Compliments any recipe! I like all of those options, Bailey 🙂 Happy holidays! 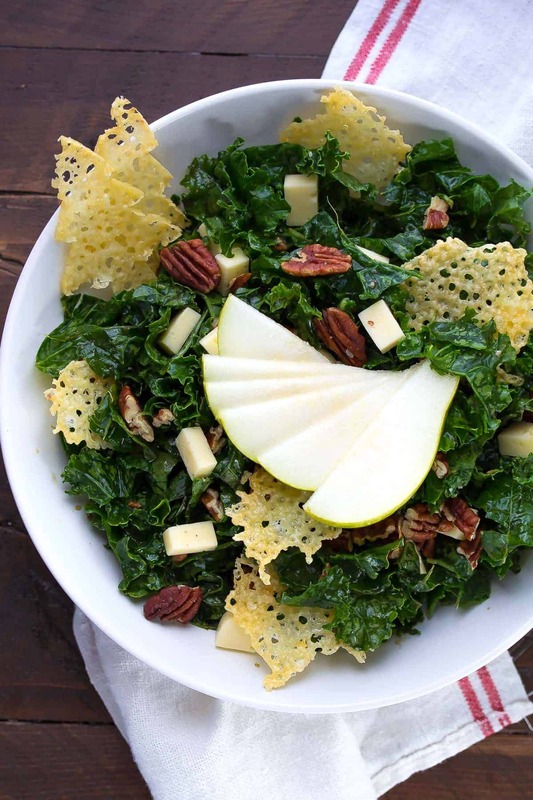 Okay, this salad looks incredible… but I’m going crazy for those harvati crisps! I think I’d eat them all before they ended up in the salad! I had to hold myself back, they are definitely addictive 😀 Thanks Aimee, and happy holidays! Those crisps look so good. I would be that one person that would eat all the crisps first then have nothing for the salad. 🙂 Sorry this year was a hard one for you, but glad you are almost done with it. Here’s to a great 2016!! Um yes…definitely a danger. I should advise people to make double the crisps to account for snackage 😉 Thanks Cyndi! WOOO for 2016!!!! 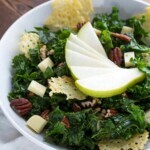 Kale salads are my favorite, and when they involve cheese (and cheese crisps! ), I can never say no. This looks delicious, Denise, and I hope you have a wonderful new year’s! I haven’t eaten enough kale salads this year, they are just so good, especially smothered in dressing and topped with goodies 😀 THanks so much, Marcie, you have a wonderful New Year’s too!! I love everything cheese. In all seriousness for eat recipe their is a different cheese that goes with it. I love sharp aged old cheddar for my nachos, with a splash of jalapeno. I love cheese chips to . I totally agree with you, Carey, it’s too hard to pick just one! But I love your idea for nachos, it sounds amazing! I will have to try it! I love Emmental cheese melted over french onion soup. We just had a cheese fondue with Emmental cheese, it’s one of those delicious and under-used ones if you ask me. Would be perfect on French onion soup! Happy holidays, Robyn! ME TOO!! Happy holidays, Shannon! I love smoked Gouda and it is wonderful in so many recipes. We love serving it as part of cheese trays, slicing it for grilled cheese and melting it over chicken. Oh I think smoked Gouda is one of my new favourites, Amber! It is SO good! Happy holidays! I like so many cheeses but a family favorite is Havarti, great for grilled cheese! Can you believe I’ve never tried Havarti in grilled cheese?! I guess I’d better get on that! Thanks, Tara and happy holidays to you! Wow I love your idea to put feta in alfredo sauce, I imagine it adds a real punch of flavour! Thanks so much and happy holidays, Wendy! My favourite kind of cheese is cream cheese and i love making cheesecake. I also love using Fresh Mozza for making lasagna! Thanks for the great giveaway! Oh cheesecake is a MAJOR weakness of mine, Natasha! Thanks so much and happy holidays! I will need this salad to refresh next week after all the sweets this weekend. Pinning!! Ha ha ME TOO! My pants have been getting tighter this week :/ Thanks, Zainab and happy holidays! Such a classic combo, and you really can’t go wrong with the classics. Thanks, Amy and happy holidays! My favourite type of cheese is 5 year old cheddar and my favourite thing to eat it with is apple pie — I like it in its natural form rather than adding it to a recipe! I love apple and cheese together, it’s my go-to afternoon snack. I haven’t had it on pie yet but I have got to try it! Thanks, Suzi and happy holidays! You and me both, Tainan! Happy holidays! My favourite cheese is Emmenthal (Swiss). I love it melted in a fondue. That’s such a great choice, Piroska! We had an Emmenthal and Gruyere fondue on Christmas eve…SO delicious! I love Brie. I make a mean mac and cheese with it! Oh my gosh, I have got to try mac and cheese with brie….that sounds to die for! Thanks so much, Courtney and happy holidays! I’ve only eaten jalapeno Monterey jack once….so good though, I need to try it again! Thanks Kelsey and happy holidays! Great choice, Lynn! I haven’t had it on nachos yet but will have to for sure! Happy holidays to you! Oh gosh that sounds so delicious, Cheryl! Now I’m hungry 😉 Happy holidays! My favourite cheese is Havarti. I love using it on my sandwiches! I also have a recipe for mini havarti egg quiches that I like. I love mini quiches! (and sandwiches of course). Great choices, Judy! Happy Holidays! My favorite cheese? I have a lot of favorites, how can i just pick one? I like mozza cheese for lasagna, chedder cheese for tacos, feta cheese for salads… oh how i love cheese! I know, it’s just too hard to pick one! Great choices, Ivy! Happy holidays! Havarti is my favourite kind of cheese, or cheddar, or gouda. I like cheese. This salad looks amazing! Thanks so much, Stacey! I can’t pick a favourite either. There’s too many good cheeses out there 😉 Happy holidays! These crisps look so good. I love anything to do with cheese and the crisps look perfect! My favourite cheese would be smoked gouda or cheddar and I love using it in scones. Thanks so much, Julia! I can’t believe I’ve never made cheese crisps before this…they are so delicious! Good luck Cindy! Great choice! OMG give me all of those cheese crisps please!! They look amazing. I get so uncreative with my salads, especially during the winter, so I have GOT to try this one. Have a merry Christmas and happy new year, Denise! Ha ha! THey are so addictive and are sadly long gone 🙁 Thanks, Rachel! I’m a liiiiiittle concerned that I would eat every single last one of those little havarti crisps and then have none left for my kale salad. LOL. This salad is SO gorgeous, Denise! That was (rightfully so) a big concern of mine too, Sarah 😉 They are so addictive. Thank-you and happy holidays!